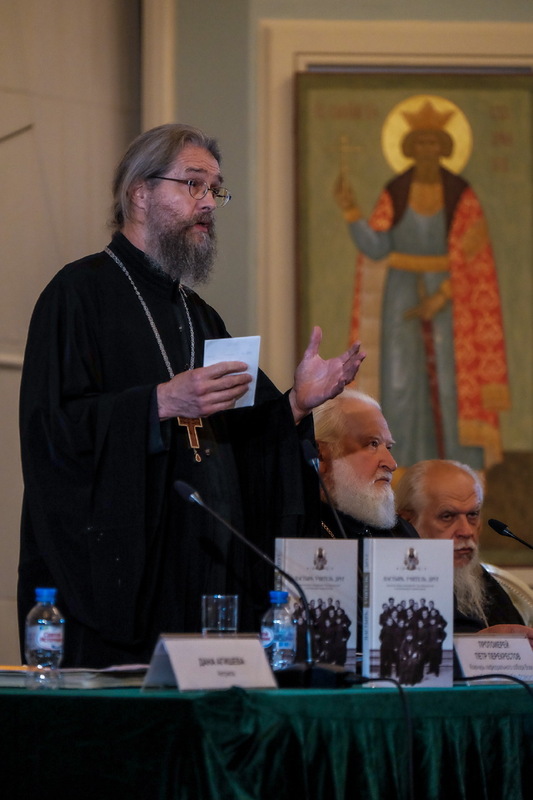 In his opening statement, His Grace Bishop Panteleimon of Orekhovo-Zuevsk expressed his gratitude to Patriarch Alexy II and Metropolitan Laurus of blessed memory, the main initiators of the unification of the Russian Orthodox Church of the Moscow Patriarchate and the Russian Orthodox Church Outside of Russia, which had been divided as a result of Soviet persecution. According to Bishop Panteleimon, events were put in motion 100 years ago which brought great destruction to Russia, to the Russian people and culture. “These events resounded throughout the world, and led to terrible consequences. One of these was the division of the Russian Church, which came to an end 10 years ago, which is of course a great victory of love, this recovery of unity, which we are all in need of. This is an example for us all that we must unite in goodness, in love, and only then can we resist evil which confounds and tempts us. Today we remember this event with joy and gratitude,” noted Vladyka Panteleimon. Protopriest Vladimir Vorobiev, the Rector of the STHU, noted that we must thank God that He gave us two hierarchs, Patriarch Alexy II and Metropolitan Laurus, who manifested the unification of the two parts of the Church. “It is difficult to overstate the importance of this event. The Russian Church recovered its wholeness: Russian people throughout the world united in one Church,” he said. “After the signing of the Act, Metropolitan Laurus would visit our university, he met with professors and students and told them about the life of the Russian Church in the diaspora,” he recalled. “Even now we don’t fully grasp the importance of this event. The largest things are best measured from afar, we need time to make a proper evaluation. I think that this time will come, and that the significance of this Act will be properly appreciated,” added Fr Vladimir. Protopriest Andrei Lobashinsky, Dean of Maloyaroslavets and teacher at Kaluga Theological Seminary, spoke on the importance of the Russian Church Abroad and St John for today’s Russia. The degree to which St John is venerated in Russia is a remarkable phenomenon, he said. It would seem strange that a bishop who served in China and America is revered in Russia. The answer to this question, according to Fr Andrei, is that the New Martyrs died at the hands of executioners, while Bishop John, living in China, sympathized with them, for he shared their spirit. His service abroad showed how the service of pastors in Russia could have blossomed had they not suffered persecution. “Through the podvig of St John, we see the light of perpetual sanctity flowing from the time of the ancient Christians,” concluded Fr Andrei. Fr Peter Perekrestov, Senior Priest at the Cathedral of the Mother of God “Joy of All Who Sorrow” in San Francisco, which contains the relics of St John, then presented his new book. It is the only book published in 2017 which is dedicated to the 10th anniversary of the reestablishment of unity within the Russian Church. Fr Peter pointed out that this evening’s event is taking place in a hall where 100 years ago, the All-Russian Pomestny Sobor [National Council] of the Russian Orthodox Church took place, which decided to restore the patriarchy, where His Holiness Patriarch Tikhon was elected. One might ask what the connection is between St John, the Pomestny Sobor and Patriarch Tikhon. In fact, St John was the spiritual son of the man who had received the most votes for the office of Patriarch at that Council, Archbishop (later Metropolitan) Anthony (Khrapovitsky), but he was also a successor to Archbishop Tikhon (Belavin), future Patriarch, on the Cathedra of Western America. Many do not know that the future Patriarch was given honorary citizenship in the United States. Fr Peter then remembered how in 1988, Protopresbyter Alexander Kiselev called him to propose that he travel to Kiev for the celebration of the 1000th anniversary of the Baptism of Rus. Concelebration between hierarchs from the two parts of the Church in principal could have taken place, but it would have been purely formal. For unity to be genuine, it needed to be prayed and suffered for, representatives of the two churches needed to accept each other, forgive each other, humble themselves. This was a process that would take time and reflection. Fr Peter noted that the reestablishment of unity within the Russian Orthodox Church was unprecedented in history. It had happened before that a part of the Church that broke away came back. But in this case, two parts of a Church, equal in importance but separated, after 80 years of division, reunited. This was truly a mystery, one which reflects the Mystery of matrimony. The actress Dana Agisheva then recited two passages from the new book and showed unique video clips of the service of St John in America and his canonization services in 1994. “Eternal Memory” was then sung for Patriarch Alexy II and Metropolitan Laurus.